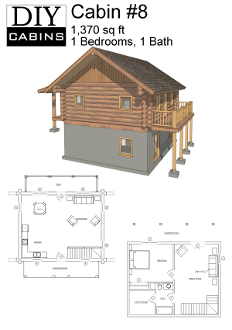 Log Cabin #8 is a 1,370 sq ft cabin with 1 bedroom and 1 bathroom. Cabin #8 is (currently) our ownly 2 story cabin. The main floor is designed for enterntainment or liesure while the basement is the main living space. The front has a 6'x26' covered porch, while the back side of the cabin offers a spacious 6'x26' balcony, both providing great spaces for entertainment and relaxation.